Hello everyone!! I’m here today with the new CASology Challenge! I have to admit, the cue card this week had me stumped for a minute. I wasn’t sure what to create or even were to begin. Its not that the word was hard because it wasn’t, I just didn’t now what to do. You see, for this challenge I love thinking out of the box. I always look in my dictionary for another meaning of the word. For this cue, it was hard to get an alternative meaning. So, I decided to go back to the basics and just play with the my stamps with no deep meaning behind it!! So you see what I mean. When you see the word “Friend”, you know what it means hands down. How do you interpret that word? I went back the basics here! I stamped and colored. I searched my stamps for a stamp set that would either represented a friendship or the word friend. I came across Lawn Fawn’s Feathered Friends stamp set. The light bulb went off, how perfect is this set. 1. I cut my white cardstock to an A2 size card (4.25 x 5.50) scored at 5.50. 2. I stamped all of the images from the stamp set on the front of my card. 3. I used Copic markers to color my image: R22, R24, Y11, Y13, YR68, E35, E37. 4. I added some Clear Wink of Stella to the hearts. 5. That was it! 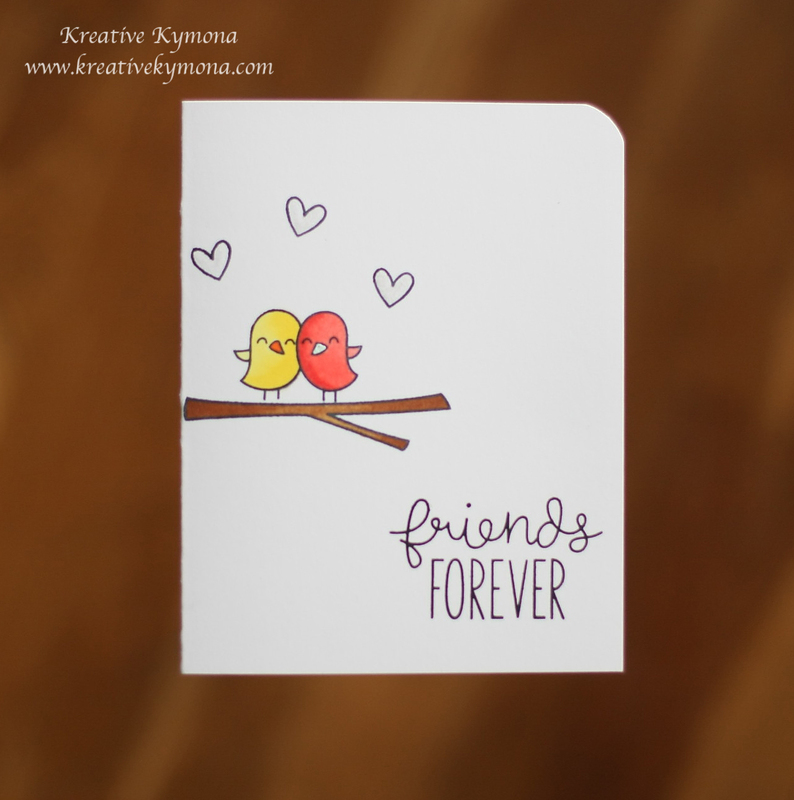 My card shows the friendship between the two birds. What could be better then that!! Don’t forget to check out what my fellow DT members have created. Now its your turn!! I can’t wait to see what you come up with. Our wonderful sponsor this week is DeNami Design. You don’t to miss this one! I’m also linking this card to the Less is More Challenge.